Addendum: 14 June 2010: Read this interesting criticism of the Copenhagen Wheel from Steven, Architectural Historian and cyclist: Two thumbs down for The Copenhagen Wheel. The City of Copenhagen and MIT have been working on a project for a while and it was finally revealed here in Copenhagen this week. The Copenhagen Wheel. An electric assist device on a back wheel that is also filled with a host of functions. Smart, responsive and elegant, the Copenhagen Wheel is a new emblem for urban mobility. It transforms ordinary bicycles quickly into hybrid e-bikes that also function as mobile sensing units. The Copenhagen Wheel allows you to capture the energy dissipated while cycling and braking and save it for when you need a bit of a boost. It also maps pollution levels, traffic congestion, and road conditions in real-time. The Copenhagen Wheel with Lord Mayor Ritt Bjerregaard in the background. Now I certainly didn't write that, above. They did. Of course they did. The most interesting aspect of the gadget, in my opinion, is that it can be retrofitted onto existing bikes. That's geekspeak for "take off the wheel you have now and put this new one on". It might also be an interesting idea in that it eliminates the need for many electric bikes and all the large, cumbersome batteries that are so difficult to dispose of. Simple, elegant and symbolic. 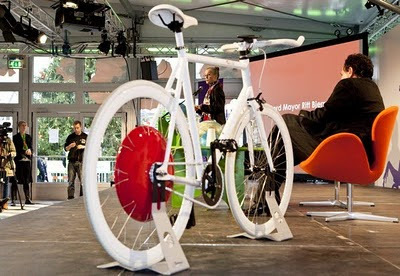 I just hope you can get versions of the wheel in different colours to match your existing bike. In Copenhagen rust-coloured wheel hubs would be a big hit. Oh, except it weighs 15 kg. Nevermind. We also have to question the wisdom of e-bikes in cities. Are we supposed to send fast moving, silent machines into mainstream bicycle cities like Copenhagen where the average speed for Citizen Cyclists is 16 km/h? We have enough problems with scooters. Do we need SILENT scooters flying past? If you think about it, everything we need for cycling in a city has already been invented. Over a century ago. Read more blah blah blah about The Copenhagen Wheel on MIT's website about The Copenhagen Wheel.